My poor husband came down with an awful cold that wiped him out for about a week. He still bundled up on Saturday and braved the freezing temperatures to conduct our second site visit with our building consultant. Another step closer to being ready to pour the slab. The cold temperatures didn’t last long and we said farewell to winter, thanks for stopping by, as the southerly flow brought back a spring-like feel. This week, we visited Factory Builders Store to see what kind of deals they can give us for our appliances. The box store holiday sales and military discount provide some great prices and we’re hoping they can beat them. An awesome friend of mine, who also knows a little something about plants and landscaping, took a walk with me around our property yesterday. She loved my prayer path and all the beautiful oaks we have. We talked about what I like and don’t like and how I hoped to use the different areas. She noted how the house was laid out, where the sun would be, and what trees we currently have. She gave me some great tips on what to keep and what to remove (too many persimmons). We still have quite a few stumps to grind down (another piece of equipment for Jon to rent). I can’t wait to see what suggestions she has in order to make our little slice of Texas look beautiful, withstand the heat and drought and not get eaten by our huge population of deer. There are so many decisions to make, I can easily feel overwhelmed. Thankfully, it comes a chunk at a time. I have so many questions, it probably drives my husband crazy (as well as our consultant, but I guess that’s what he gets paid for). Really, though, I’m trying to alleviate as many “why didn’t we think of thats” as I can. Two of those decisions have to do with our water softener and our propane tank. We’ve never had a water softener before, but from what I understand, our appliances and my hair will thank us. However, I am concerned about the taste. We are proponents of drinking tap water (less expensive and tons less waste) and most of the places we’ve lived had decent drinking water. After some discussion with our plumber (and reaching out to a couple of people we’ve already met in River Chase), we decided we’ll definitely have one, but have the cold water plumbing to the refrigerator and kitchen sink bypass the water softener. The plumber says he does it quite frequently. So, I think that problem is solved. Although, we still need to research and decide upon which water softener system to purchase. It’s on next week’s to do list. The challenge with the propane tank is location. We can’t put it where we hoped because of distance to property line and building restrictions. Which is unfortunate, because it could have been an above ground tank, which would have saved us some money. Our consultant said the best spot would be somewhere up front, with easy access to the driveway (for refills). It will have to be buried, however. I had lots of questions, but we were reassured they do this all the time with the companies we would be using. I say companies, because three different ones will have a part in setting the tank! Apparently, the septic company will dig the hole for us. For a fee, of course. The propane company will install and set up the tank. And our slab company will cement it in place and (hopefully) back fill the hole. I am amazed at all the moving parts and steps it takes to build a house. And we haven’t even started framing. Did I mention feeling overwhelmed? The rest of my week was filled with organizing the bids and invoices coming in, setting up payments, and documenting estimates and actual payouts. We also paid our first construction loan payment. And our rebar has been set. Interesting what lies beneath a foundation. Things continue to move along. 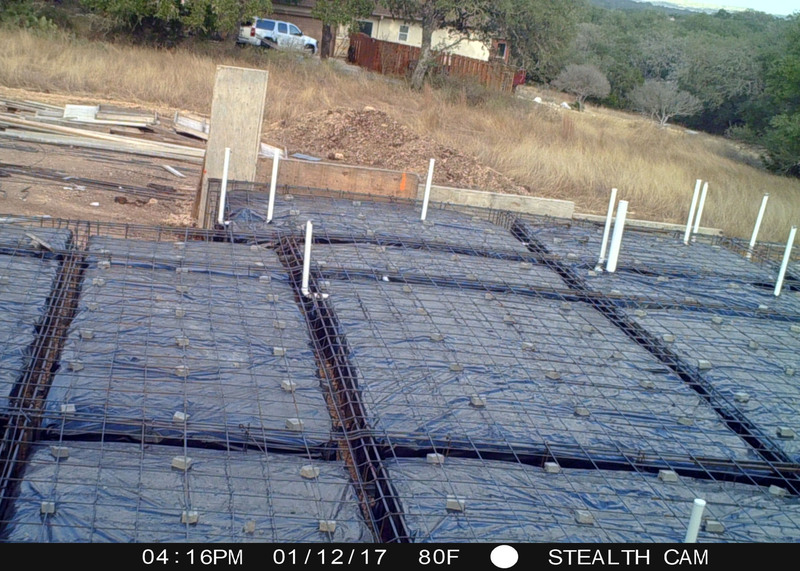 This entry was posted in Hill Country Living and tagged Country Living, Factory Builder Store, River Chase, Texas Hill Country, UBuild It. Bookmark the permalink.